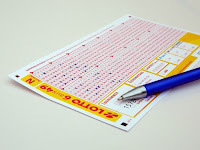 (Image: https://pixabay.com/en/lotto-lottery-ticket-bill-profit-484801/) for the proverbial time on the couch to catch a movie, I see themes and actions that I can bring into my classroom of life in some way. I was recently in conversation with other professionals who were in fields other than teaching, and the subject of winning the lottery came up. A couple of them said that they would not show up for work the next day. One said that he would be able to retire early. Then, they turned to me and asked what I would do, and my comments were the same that I said to my students when they once asked me the same question. My students had asked me if I would even show up for work if I won the lottery. I responded, "You know what? I would still be here with all of you, but there would not be a KIA in the parking lot." You see, I'm in a profession that I love. I have already won the lottery.